Aired on Friday, October 12th. Originally formed at The Juilliard School, Tesla Quartet won 2nd Prize at the prestigious Banff International String Quartet Competition in 2016. And their very first CD is just being released this month. Chamber Music Tulsa is pleased to bring this special collective back to our community; they were last in town in 2013. Tesla will offer a pair of exciting concerts this weekend: tonight (the 12th) at the Renaissance Square Event Center on 11th Street, and then Sunday afternoon (the 14th) at the Williams Theatre in the Tulsa PAC. Our guest is Serafim Smigelskiy, the cellist in this group. To Be Presented This Weekend by the Signature Symphony at TCC: "Yevtushenko and Shostakovich"
On this edition of our show, we learn about the next concert to be staged by the Signature Symphony at TCC, "Yevtushenko and Shostakovich," which will happen on Saturday night, the 4th, at 7:30pm (at the Van Trease PACE on East 81st Street). This concert will honor the life and work of Yevgeny Yevtushenko, the late poet and author who died earlier this year, and who taught at the University of Tulsa and contributed to our city's cultural life over the last 30 years. Tomorrow night, Saturday the 16th, the Tulsa Symphony Orchestra will open its new season with a Gala Concert at the Tulsa PAC (beginning at 8pm). On the program, the "Hungarian Dances No. 1 and No. 5" by Brahms, the "Miraculous Mandarin Suite" by Bartok, and the masterful " Piano Concerto No. 2" by Brahms (which will feature a special guest soloist, the noted pianist Jon Kimura Parker). Some 30 years ago, the Kronos Quartet created a sensation by releasing an album of chamber music that included an arrangement of Jimi Hendrix's "Purple Haze." Now Brooklyn Rider, another gifted string quartet, is again blurring the boundaries between classical and more popular kinds of chamber music. Fresh Air classical music critic Lloyd Schwartz says he admires that blur. On this edition of StudioTulsa, we are pleased to welcome Menahem Pressler, the internationally renowned classical pianist, who is best known as a founding member of the long-running Beaux Arts Trio --- and who has been described as "a national treasure" by The Los Angeles Times. A truly distinguished and esteemed German-American musician who will turn 90 later this year, Pressler has been, since the mid-1950s, a member of the piano faculty at the Indiana University Jacobs School of Music, where he is now the Distinguished Professor of Music in the Charles Webb Chair. An abundance of facial hair is not restricted to the sensitive male indie-rocker set. 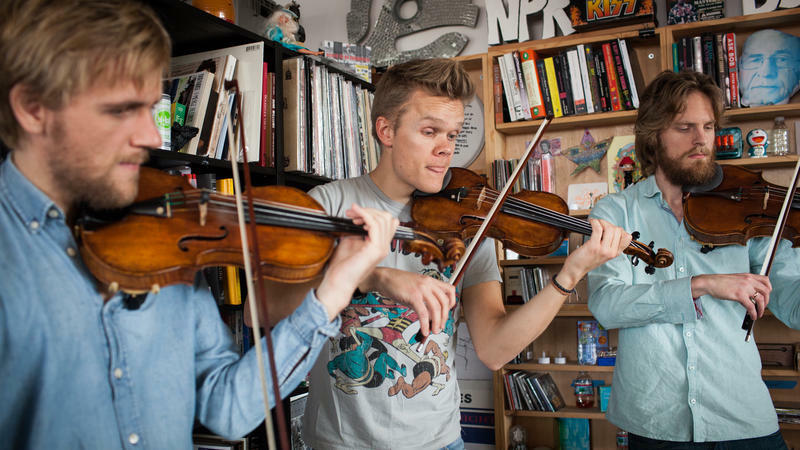 Three of the four players in the Danish String Quartet could easily pass for hipster Brooklyn beard farmers. "We are simply your friendly neighborhood string quartet with above average amounts of beard," the group's website says. Yet what's really important about the ensemble is how they play — and judging from this performance behind Bob Boilen's desk, these Nordic lads possess warmth, wit, a beautiful tone and technical prowess second to none.